Independent sleeping seat has an anatomic Egg-shaped form and a board high enough to provide safety for a baby. Such seat design allows your child to lie in a proper sleeping position. With the Hot Mom Pushchair, you will surely stand out from the crowd of other mums. Eye-catchy and beautifully designed, it is also one of the most functional and versatile strollers on the market that can be converted to a bassinet and then back to a stroller in one quick movement of hand. The model is offered in 2 colours. The advanced hand-operated parking brake allows you to feel more confident on a road making it easy to stop the stroller at any moment. The storage basket is somewhat small. Durable and functional jogging stroller with all-terrain wheels - a perfect solution for active parents who do not want to give up on sports after the birth of their child. The stroller is strong enough to cope with all terrains including rough roads and cosy enough to provide your baby with the feeling of comfort. The model is available in 4 colours. Easy-Fix-System with integrated adapters allow you to remove a baby seat easily and quickly. The construction is foldable and rather compact to take a stroller with you. The assembly instructions might seem rather complicated. This universal 3-in-1 baby stroller is designed to provide comfort both for young parents and their children and to suit a variety of different activities. Features functional design, reliable safety system, and a spacious storage basket. Presented in 4 colours. What stands the Graco Stadium Duo apart is four reclining positions making it suitable for children from the birth up to 3 years of age. Each seat can be adjusted separately to suit the needs of both kids. When the rear seat is folded, there is no access to the storage basket. A practical double stroller will be comfortable both for parents and for children. The model isn't bulky and can easily cope with any road conditions. 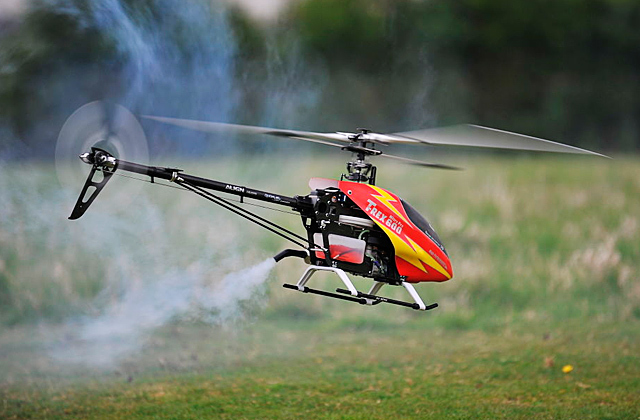 Due to its manoeuvrability, you can run it with one hand. Big canopies will shelter you babies from the inclement weather. What do parents usually pay attention to when choosing a stroller? Most of them look out for the safety and comfort features. Yet, with the growing popularity of convertible and universal baby gear, a lot of people turned their attention towards other things, like whether a stroller is convertible, how good it looks, how compact it is, is it easy to transport it and fit in a car and so on and so forth - people seek comfort and convenience to match their lifestyle. Knowing this, Hot Mom does its best to meet the needs and requirements of all groups of customers producing functional and universal baby gear to suit any need. Whether they've succeeded in this venture or not, we can judge on the example of its Hot Mom 3 in 1 stroller. The Hot Mom 3 in 1 stroller looks modern and stylish making it a good choice for parents who want to fashion travel. 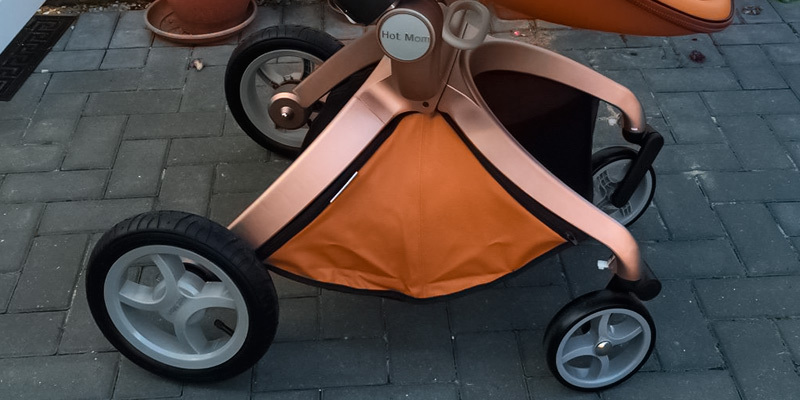 However, the attractiveness of this model isn't limited only to its luxurious design - the Hot Mom stroller swiftly combines looks with safety and comfort. 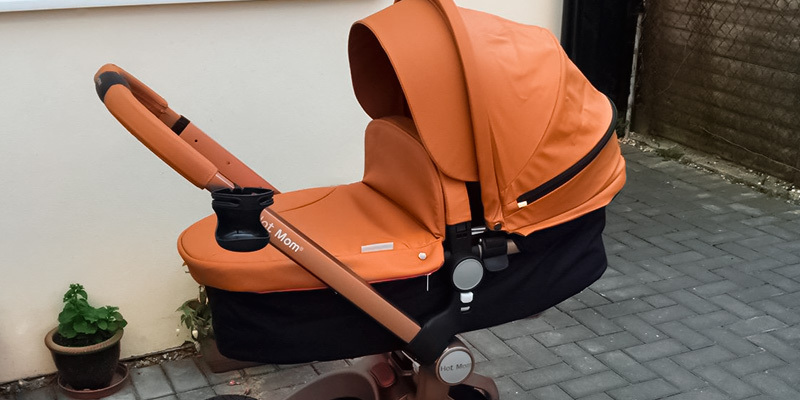 Knowing that babies spend most of their time sleeping, the manufacturers paid a lot of attention to details and developed a stroller that allows them to feel cosy, safe, and comfortable when they do so. One of the greater advantages of the Hot Mom pushchair is that it comes bundled with a bassinet which can be used from the birth up to 9 months and that it has a second seat which can be used by kids up to the age of 3. 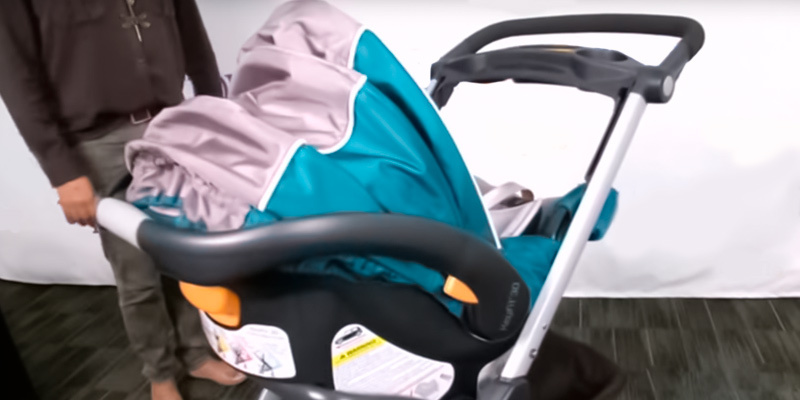 The stroller features 3 adjustable positions allowing you to recline the seat: 95 degrees when your child is active and doesn't sleep, 135 degrees when a child is dozing, and 175 degrees when your child sleeps. Fashion and comfort are not the only things Hot Mom focuses on. All of the Hot Mom strollers are designed with the safety in mind, too. Speaking of the current model, this pushchair is produced from a waterproof material and comes with a triangle frame that is capable of holding up to 80 kg of weight. Furthermore, it is fitted with a safety belt to hold a child securely in the seat and to provide enhanced support on the road. The wheels of the Hot Mom 3 in 1 pushchair are lockable and feature multiple suspension and easy-to-use brakes. The canopy is large enough to provide great protection against rain, heat, and wind. 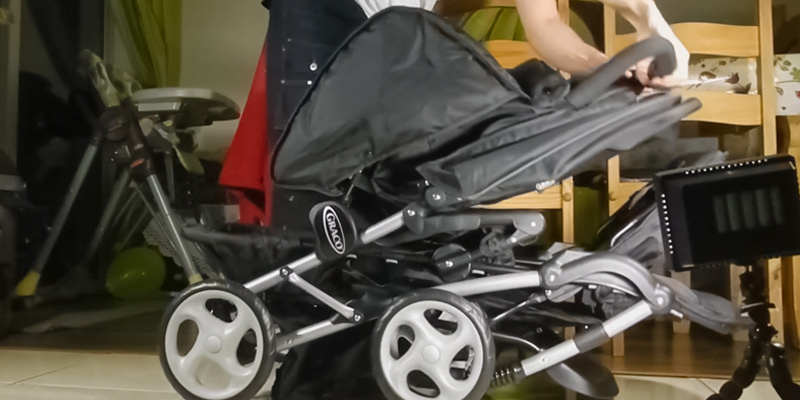 However, the biggest benefit of the Hot Mom 3 in 1 pushchair is that it's easy to convert it from a stroller to a bassinet and the other way round in one quick movement of hand, which makes it the best option for active parents who often travel by car with their kids. Easy installation, trendy design, and great safety features are what stands Hot Mom strollers apart from the competition, making them a solid choice for all those customers that do not want to compromise when it comes to quality and who want a stroller to be not only functional but fashionable as well. With the Hot Mom 3 in 1 pushchair, you won't go wrong. Established more than 30 years ago, the Baby Jogger company keeps producing top-quality strollers with the focus on the needs of active parents. The Baby Jogger City Mini GT Stroller is considered as one of the most successful of them which can be used for travelling, walking and jogging. Thanks to the patented quick-fold technology, you can fold it quickly with one hand and fit it snugly in a car truck or elsewhere due to its extremely compact folded dimensions. 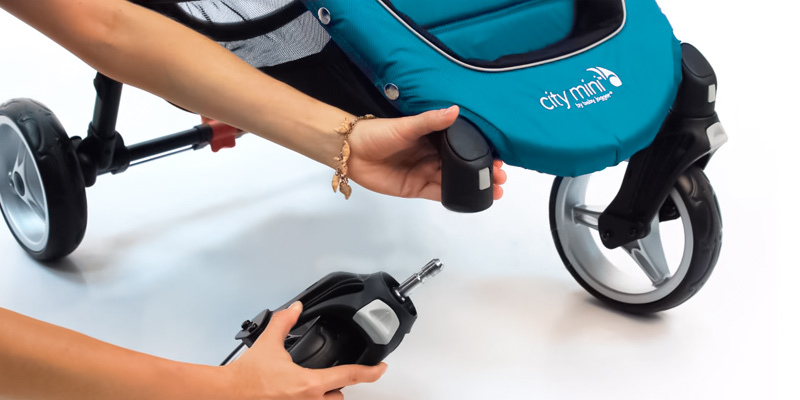 The Baby Jogger City Mini GT Stroller has all-terrain wheels which, along with the front wheels suspension, make it very manoeuvrable and allow it to ride over any road surface easily so that you can enjoy the strolls with your baby, knowing that your child doesn't experience any discomfort on the move. When it comes to the safety features, the Baby Jogger approached it as scrupulously and seriously as the stroller design. The Baby Jogger City Mini GT Stroller has obtained a strong and reliable 5-point safety harness system, an adjustable handlebar for convenience of parents and a hand-operated parking brake for better control on the road. Suchwise, the stroller not only is able to survive any terrain conditions but it also provides the fullest control making it safe for parents to travel with it and even jog. A perfect product for those consumers who haven't given up sports after the birth of their child and would like to combine their favourite sports activity and strolls with their baby. In addition to the aforementioned advantages, the City Mini GT has many more features that parents should appreciate. 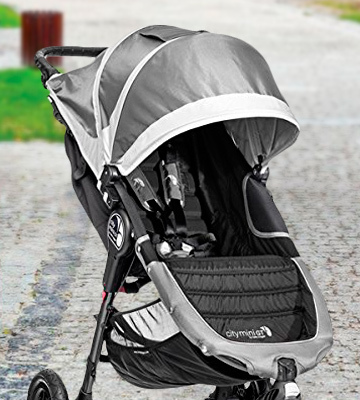 Like most strollers, the City Mini GT has a canopy for additional protection against sun, rain, and strong wind. The canopy has 3 sections and two peekaboo windows allowing parents to look after their babies while being on a stroll. The handle of the City Mini GT is adjustable and can be set at the height of 76cm to 107cm from the ground. This is a relatively new modification which was not implemented in former Baby Jogger City models and is rarely found on strollers of other brands. However, one of the greatest advantages of the Baby Jogger City Mini GT is a comfy seat designed specifically for small sportsmen. 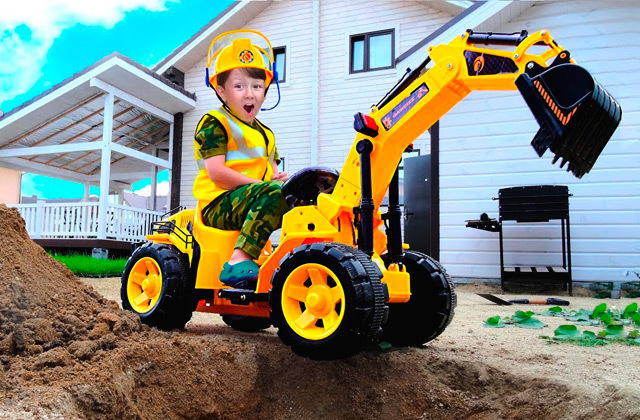 The seat is soft enough for a child to feel comfortable on the road yet sturdy enough to absorb vibration and bumps of the off-road conditions. With the size of 35cm in width and 66cm in height, the seat has ample space to accommodate even a tall child, while the recline system which adjusts almost to a flat position makes it suitable even for a newborn kid. The Baby Jogger City Mini GT is good not only for jogging but for shopping as well. There is a large pocket on the back and a storage basket underneath the stroller. Parents who need more stuff at hand may want to consider purchasing an optional travel system which may include a snack tray with a cup holder, universal parent console, glider board, belly bar or a car seat adapter. As you can see, the Baby Jogger City Mini GT allows for a lot of options making it suitable not only for devoted joggers but for all the rest as well. The Hauck Shopper SLX Trio is a perfect purchase for those customers who've come in the market looking out for an all-rounder. 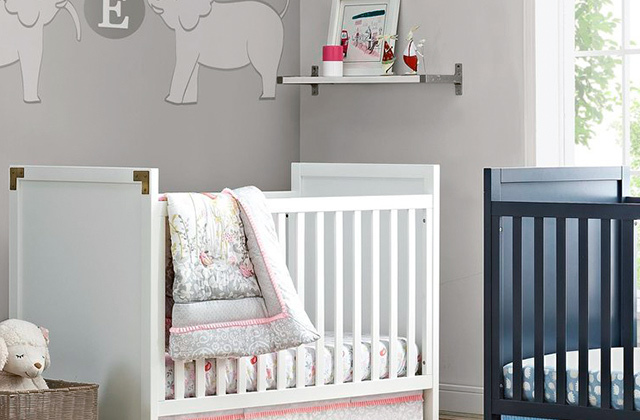 The set includes a baby buggy, a car seat, and a carry cot which can be used literally from the first day of your baby's life. With the Hauck Shopper SLX Trio, you'll never have a problem transporting the stroller with you because, when folded, it is so small you'll easily fit it in any car truck. But in spite of its compact dimensions, the frame of the stroller cannot be described as flimsy. It is lightweight but very robust. The Hauck Shopper SLX Trio is fitted with extra-large wheels and suspension so that it could ride over the toughest terrains without causing any discomfort to a child. The rear wheels are fixed for greater stability and the brakes are strong enough to bring the stroller to a halt abruptly even on a slanted hill. With all that, the stroller is very manoeuvrable and easy to control with only one hand thanks to the non-slip push handle. What else we'd like to mention about the Hauck Shopper SLX Trio is that it's not deprived of a storage bag which makes it suited for a great variety of activities. The biggest benefit of this stroller set is that all of its components are suitable for kids from the birth. The included Zero+ car seat features side-impact protection and a padded belt to secure and support the child during travels. The seat is made of a shock-absorbing foam which naturally aligns with the body curves of the child and provides the child with the feeling of cosiness and comfort in a car. If you combine Zero+ car seat with a chassis, you'll get a convenient Shop’n Drive system to take with you when going shopping. The Hauck Shopper SLX Trio stroller has an extra-large storage basket for storage of goods and other essentials, a drink holder for a bottle of juice or milk, and a reliable handbrake for additional control on the road. Basically, the Hauck Shopper SLX Trio has everything parents usually seek in baby strollers, including some additional accessories which rarely come included in other sets. The Graco company is a distinct manufacturer of baby products which develops some of the best items for kid's comfort. Along with car seats, play yards, chairs, jumpers, they also produce top-notch strollers and pushchairs one of which we'd decided to bring for your review. All of the Graco strollers are made with the safety of children in mind and produced from quality and durable materials which would stand to test of time. The Graco Stadium Duo hasn't become an exception to that rule. It features a sturdy and robust frame that is made to last and withstand the harshest conditions of the road. The Graco Stadium Duo is the only duo-stroller model on our list that is designed for two kids, with one seat being suitable for kids from 6 months and the other one from the birth. 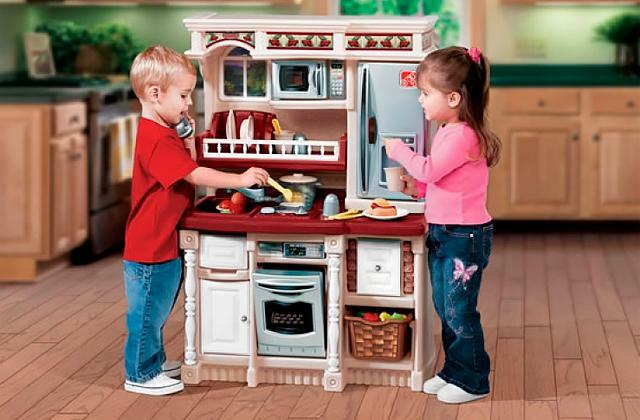 This makes it the best solution for parents of siblings of different age. With the Graco Stadium Duo, you will never encounter a problem of dragging around a bulky stroller, which is rather a common problem when it comes to double strollers. Despite the fact that it has two seats, the stroller is very lightweight and easy to carry. Not only that, like all strollers, the Graco Stadium Duo folds compactly for space-saving storage and/or transportation. It won't be an exaggeration to say that the Graco Stadium Duo may become the best investment for all parents who have two kids. It's not only stylish and handsomely-designed but also safe and extremely comfortable, of which we will tell you next. High level of comfort is what distinguishes all Graco baby strollers. 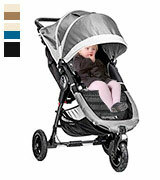 The manufacturer uses only durable fabrics and foam padding to ensure that babies feel comfortable in a stroller. Another remarkable feature that stands their strollers apart is bright and modern designs perfectly complimenting any interiors. Speaking of the Graco Stadium Duo, it's got all that and some then. Walking with two kids means carrying twice as much stuff. Understanding that the company fitted this double stroller with a storage basket big enough to accommodate not only kids' essentials but also some of the parents' belongings. The seats of the stroller are stadium-style, meaning that a rear seat is slightly raised to provide a child sitting behind with a better view of the world and things around. Talking about safety features, the stroller features a sturdy frame and each seat is equipped with a reliable 5-point harness system. Furthermore, the stroller has two Ultra Violet canopies to shield children from dazzling sun, rain, and gusts of wind and offers some little extras such as play trays. Despite the fact the Graco Stadium Duo has seemingly large dimensions, it is manoeuvrable enough to go in any tight and narrow spaces and to steer with one hand. We believe that the Graco Stadium Duo is the perfect value for the money for all families of several kids who are looking to buy a functional stroller that would come with all needed accessories and wouldn't cost an arm and a leg. If you're a happy parent of two, you won't go wrong with the Graco Stadium Duo. The Chicco Bravo Trio System comes with a stroller seat, infant seat, and a base. This means this stroller offers three unique modes of use which can be adapted to changing travel needs as your baby grows. The infant car seat is designed with the safety in mind, it is sturdy and can easily accommodate children weighing 4 to 30 pounds. While this seat is designed as part of a stroller, it can also be used as an infant carrier give that you attach it to the base with a special adapter or fix it to the backseat of your car. Such sophisticated and at the same time simple design that Chicco is famous for provides great versatility making this stroller suitable from the very birth of your child up to the time he weighs 50 pounds. A multi-position reclining stroller seat will snug your infant and offer natural sleeping position if the baby gets drowsy as well as a convenient upright position for your little one to explore the world outside. Besides, an all-wheel suspension helps to create the smooth ride. A 5-point safety harness ensures tight and secure fit holding the baby in the seat. And an extendable 4-section canopy will protect your little one from harmful sun rays in the summer heat or from wind and rain in a cold season. Meanwhile, the lovely peek-a-boo window contributes to overall convenience giving you an opportunity to see the baby all the time. An incredible Chicco baby stroller is extremely convenient not only for the baby but also for the parents. Using an easy-to-reach handle, you can quickly and almost effortlessly fold the stroller into a compact free-standing position by one hand. A durable all-wheel suspension will allow you to manoeuvre through city houses with ease. 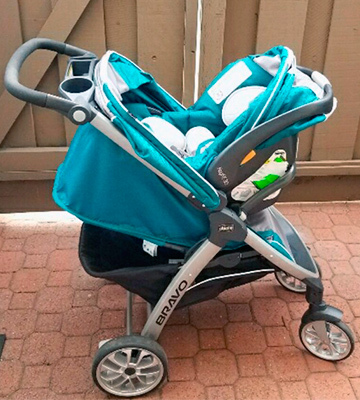 A linked rear breaks are easily activated to keep the stroller securely in place. 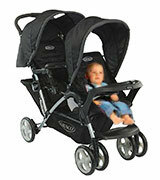 And a height-adjustable padded handle will bring utmost comfort to all moms and dads strolling with their kiddies. At the same time, a handy parents tray with two cup holders will accommodate all the essentials within easy reach. 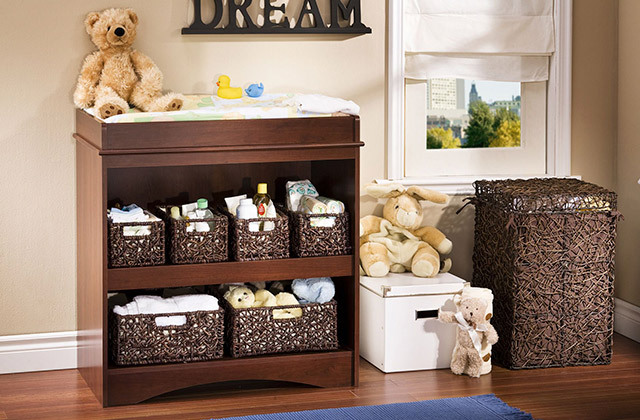 Whereas a handy and spacious storage basket will be of great use to hold the baby's stuff or some purchases if you decide to drop into the shop. We are sure, that this unrivalled baby stroller will meet all the needs and expectations of the most demanding parents! At different times and in different countries people used an array of various transportation vehicles to carry a child. After all, today baby strollers gained the greatest popularity. A stroller industry started to flourish at the beginning of 20th century. And now the market is overfilled with an enormous variety of different baby bassinets and strollers. Hence, any mom or dad can select a stroller that will be best suited for both parents' habits and baby's needs. There are luxurious and extra comfortable, affordable and convenient baby strollers, models for parents who mostly drive the car and use the stroller from time to time and for those who prefer long enjoyable strolls in the park. In our review, we will give you a couple of points how to choose the best baby stroller from a large selection of toddler and infant models. It is not a secret that for the newborn baby nothing can be better than gentle and soft mom's hands. However, sometimes it is inconvenient for a mom and acquiring a baby carrier is the best way out. Also, you can give your baby the soothing comfort with a baby bouncer. These are safe and comfortable cradles that can rock, swing and jump, giving you time for yourself and other daily activities. And with baby walkers, your little angel can quickly master his/her first steps! 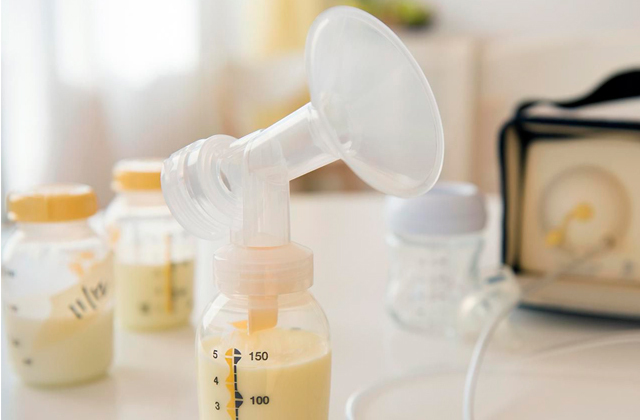 You do not need to spend a huge amount of money to buy quality baby products. There are a lot of baby strollers in a cheap price range that may suit your needs. Though they might not include any additional frills and most of them won't bundle other items such as a car seat or a bassinet, most of these models will still be pretty good. So what can you expect of a stroller from a cheap under £100 price range? 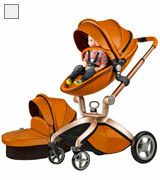 Strollers of this range will have an adjustable seat, a handlebar, of course, a harness system, and a storage basket. Most of them have lightweight frames and foldable designs, and most of them are designed for kids from 6 months. 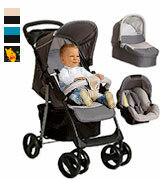 You will find a lot of nice strollers and buggies in this price range. 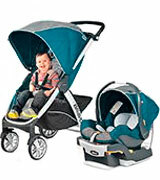 Most of the strollers of this price range come in sets consisting of several more items. 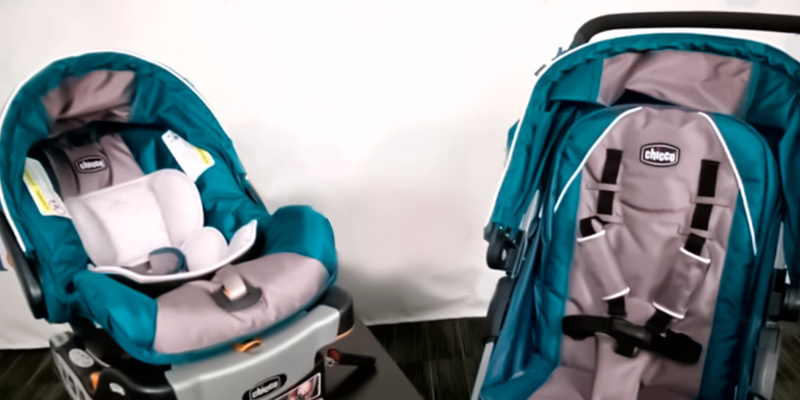 Among these models, you'll be able to find 2 in 1 or 3 in 1 sets that would bundle, along with a stroller, either a bassinet or a car seat, or both, depending on what set you choose. And despite the fact that these sets aren't exactly cheap, you will still be able to save more than 40% on purchasing these items separately. 2 in 1 or 3 in 1 stroller sets are most suitable for babies from the birth up to the age of 3. They are beautifully designed and comfortable to handle. 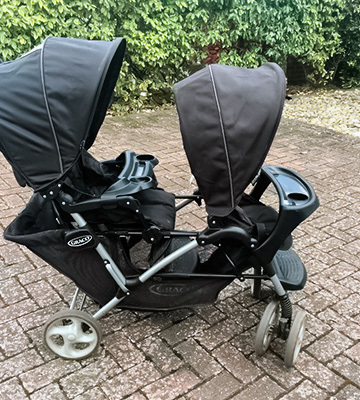 As a rule, seats of these strollers have several recline positions, they have bigger canopies, and often include some little extras such as rain covers, drink holders, play trays etc. Furthermore, they feature more robust brake systems and bigger wheels for riding over different terrains. In this price range, you may find a great variety of strollers, including double strollers, with the features that you need. Many parents wonder whether expensive baby strollers are better than those from a mid price range or it's just a matter of prestige and status. Well, it mostly depends on the purpose of your purchase. If you chase after branded products and do not shy away from investing hundreds of pounds into a stroller just to stand out from the crowd of other moms while walking with your baby for a couple of years the most, then why not do that if you can afford? Another scenario is, you plan on becoming a parent not only of one child but maybe several more in the future and you do not want to go through the same hassle of searching for baby gear again, then why not get an expensive stroller and rest assured it will serve you for a long while? Baby strollers that cost more than 1000 pounds are surely made to last and to last for quite a long period of time, of that you can be sure. Not only that, they also stand out for their gorgeous design that can emphasize the style of every active and confident parent. Q: Which one to choose: Travel System or Stroller Frame? A: Both of these options will make your life easier. 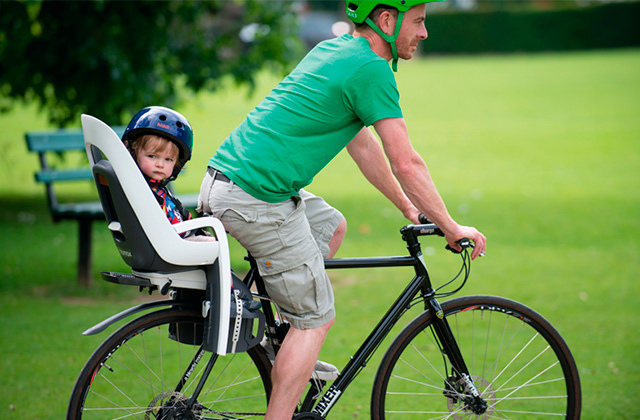 A stroller frame is just a frame that allows you to snap a car seat on to make a stroller. While a travel system is a buggy with a Group 0+ infant car seat. 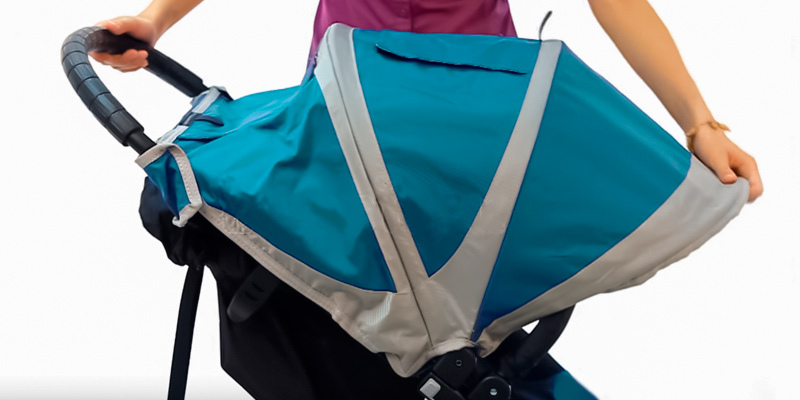 This system allows you to clip a car seat or a carrycot onto the frame or use them separately. It is an extremely smart option as such system grows with your baby. You are able to use a carrycot or a car seat for newborns and a stroller for toddlers. So, a travel system is a multi-piece set that includes a stroller, a carrycot and, in some cases, an infant car seat. By the way, the travel system has lots of advantages providing you with maximum convenience and support. You get a perfect device with all needed accessories, a huge storage basket, and fully reclining seats. Q: What do I need to buy a travel system for? 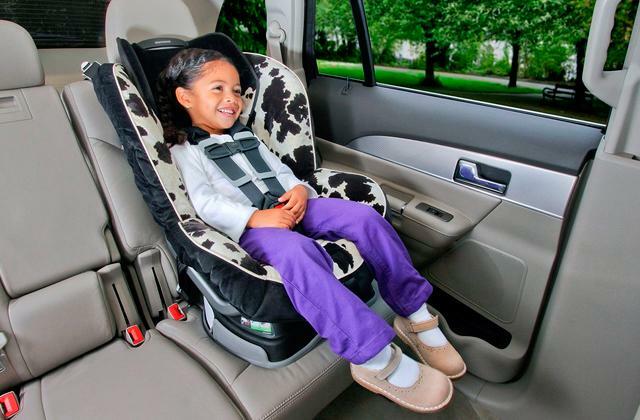 A: The travel system is usually used to support and protect your baby in a car. It is suitable even for newborns, but you should keep in mind that it is not suitable for sleeping. If you travel with a small child, do not let him stay in the seat longer than 2 hours unless you equip the system with a special lie-flat seat allowing for the child to get some rest on the road. Travel systems are indispensable for parents who often travel by car and want to provide their kids with maximum comfort and safety. Q: Is there a travel system for twins? A: Yes, there is. The market offers plenty of options for parents of two. Instead of walking with two strollers, you can get a two seat stroller and walk two children at once. There are two travel system options to choose from. 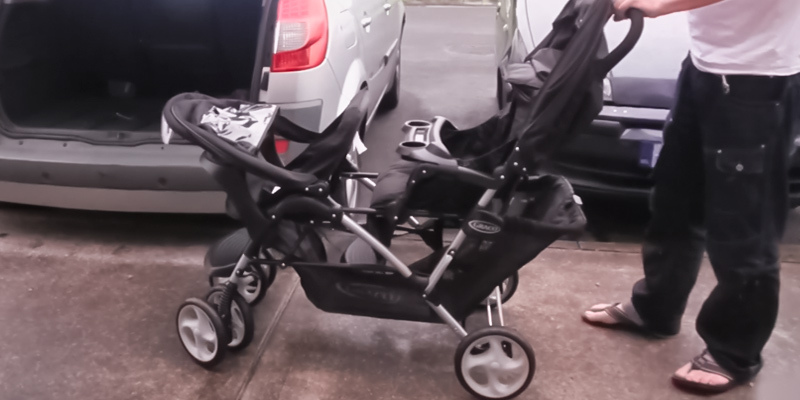 The first one is when seats come attached to a stroller, and the second one is when the stroller has one car seat for a smaller child and a buggy chair for the elder one. Q: What are Group 0+ seats? A: It is extremely important to choose the best seat for travels for your baby. So the car seat is a perfect way to protect your little one. To help you choose the right one, all seat types are divided into several groups according to the weight and age of a child. Group 0+ is suitable for newborns that are not able to sit upright and need a special reward-facing car seat. Usually, it can be used from the first day up to the age of 9 months and the maximum weight of 13 kg. Group 1 is designed to be used from the birth to 4 years. The seat can be rearward and forward-facing with a maximum weight of 25 kg. Group 2 features a high-back booster seat which is perfect for toddlers from 4 to 6 years up to 36 kg. And the last one is Group 3 is up to 11 years with the maximum 125 cm height. Actually, lots of car seats suit more than one age group because they are adjustable. 1.How to Choose a Stroller, Babylist. June 1, 2017. 2. How to Buy a Stroller, BabyCenter. 3. Baby Strollers Buying Guide, The Spruce. 4. Choosing a Baby Stroller, WebMD. 5. How to Pick the Perfect Stroller for Your Baby, Parents. 6. Best Stroller Buying Guide, Consumers Reports. 7. 2017 Moms' Picks: Best strollers, BabyCenter. 8. Steven John The Best Stroller You Can Buy, Business Insider. November 2, 2017.